When player has 2 cards and that cards points are not good for stand then he or she may ask another card and this is known as hit. A player can hit as many times as he or she want until bust. If the 1st 2 cards has the total point 21 or close to it then the player can stand or after hitting a few times or just once, when the player has point close to 21 without busting, then the player can stand and if the point is higher than the dealer's the player will win. 2. In United States, player can double the initial betting amount if his hand point is 9-11 but in United Kingdom there is no such condition. 3. If the player don't have 21 then he or she can double their betting amount. 4. 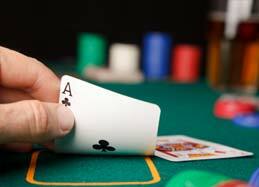 If the player calls hit after the initial bet, then the player can not call double down. When, the player has the 1st 2 cards, the player can split his 2 cards if he has the pair. The pair can be split for any cards in United Stated but in United Kingdom pair of 10, 5 or 4 can not be split. When it is a pair of ace, player can split and will get another card and if the card is 10 then total hand points will not be a blackjack. This is another option of blackjack and this is also the worst too for professional blackjack players. If the player call insurance and the dealer win then the player has to pay the initial betting amount but if the player wins then the player will get 2:1 and the house edge for insurance is really high, so it will be better for each player to avoid insurance.